Hello, It is a pleasure to be here today, my name is Thomas Mack and I am the President of the Aleut Corporation; the largest land owner in the Aleutian/Pribilof Island region with 1.56 million acres of subsurface and 77,000 acres of surface estate. I am an Aleut who was born and raised in King Cove, AK which is located on the tip of the Alaska Peninsula and the start of the Aleutian Islands. The Aleut people have been stewards of this land and the vast surrounding waters for over 10,000 years, during which time we adjusted to a multitude of environmental, climate and human factors. In more recent history, the Aleuts adapted to the Russian fur traders, World War II attacks, internment and relocation. And now we are witnessing the opening of the Northwest Passage shipping lanes which will bring even more changes … and we will adapt to those changes and embrace this opportunity with the same forethought and diligence that has been done for the past 10,000 years! Geographically, the Aleutians are positioned as a gateway between Asia and the Northwest Passage. Our resources and infrastructure are strategically placed to service the logistical needs of worldwide shipping, be it by sea or air. Cold Bay, for example, located at the tip of the Alaska peninsula, is a major air hub of the Aleutians. We regularly see the second largest production cargo aircraft in the world, the AN-25 refueling in Cold Bay. It is also a designated emergency runway for the space shuttle program. 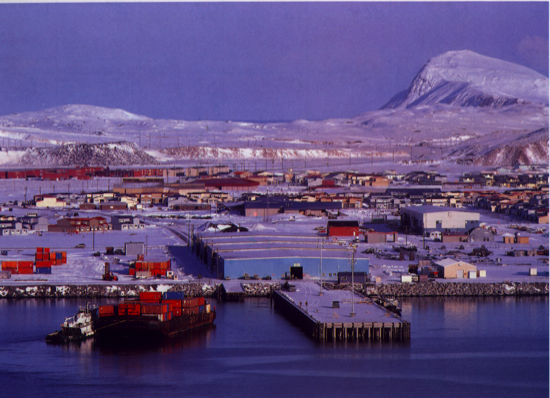 Adak with the former Naval base infrastructure will be a key staging area for goods headed North and West. The port is ice free and dock infrastructure is currently in place to fuel vessels up to 700 feet. The main cargo pier is currently capable of handling vessels up to 550 feet. Combined with its 20 million gallon fuel farm facility and two 7,000 foot runways, Adak will be a key shipping location. These are just two of the 12 thriving communities that make up the Aleutian Pribilof Islands region. Aleut Enterprise LLC, an Aleut Corporation subsidiary, has recently attained the status as both a Primary Response Action Contractor and an Oil Spill Removal Organization. This allows the company to promote awareness, training, and quicker response times to insure we are proactively prepared for the increased shipping activity. We look toward the future shipping lanes optimistically but cautiously. We support increased Coast Guard presence, as well as further research on the effects of increased ecological pressure. With eons of experience we know both how to care for our land and water and enhance our way of life. We also know how to develop businesses and industry. Combining the two efforts, the Aleut region is poised and ready to be a part of this new transportation transition. And, I will be glad to talk more and go into greater detail on the topic of shipping and port infrastructure readiness in the Aleutians to anyone who is interested after this panel, but for now I will defer the rest of my time to the great gentleman Matt Ganley from BSNC. Thomas Mack has been the President of The Aleut Corporation since February 2006. In this role, he actively promotes Aleut’s positions on culture, education, economics and resource development issues. He communicates key Aleut messages to a wide variety of audiences, conveys policy recommendations to government leaders, works to increase outside funding for regional programs and partners with community leaders and legislators on Aleut-related legislation and policy issues. From April to August 2010, along with his presidential role, Mr. Mack served as Interim CEO. He was also a recipient of the Anchorage Chamber of Commerce’s “Alaska’s Top Forty Under 40” award in 2009. Operations of the Aleut Corporation and its subsidiaries include government contracting, fuel sales, telecommunications, industrial products and services, and real estate management. The company also participates in various partnerships, joint ventures and other business activities. Mr. Mack was raised in King Cove, Alaska, which is located on the tip of the Alaska Peninsula. After graduating high school, Mr. Mack attended the University of Nevada-Las Vegas and the University of Alaska-Anchorage where he acquired a bachelor’s degree in education. Mr. Mack taught in the Anchorage School District for just less than 10 years. While teaching, Mr. Mack received a master’s degree from Western Oregon University. He also holds an MBA from Alaska Pacific University. He is a shareholder of The Aleut Corporation and King Cove Corporation.